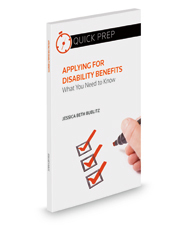 Applying for Disability Benefits will help you decide whether the process of applying for Social Security disability benefits or supplemental security income benefits is right for you. This guide is a quick and easy way to get the advice you need in order to decide whether to apply or not, and if you do, gain a comprehensive understanding of the process. After reading this book, you will know what to expect during each phase of the process, how long it takes, and what you can do to help prepare for your case. The book offers guidance on what you can do to help your case and what to expect at the hearing. Ultimately, this resource should help take some of the anxiety and mystery out of a very complicated and difficult-to-understand system.